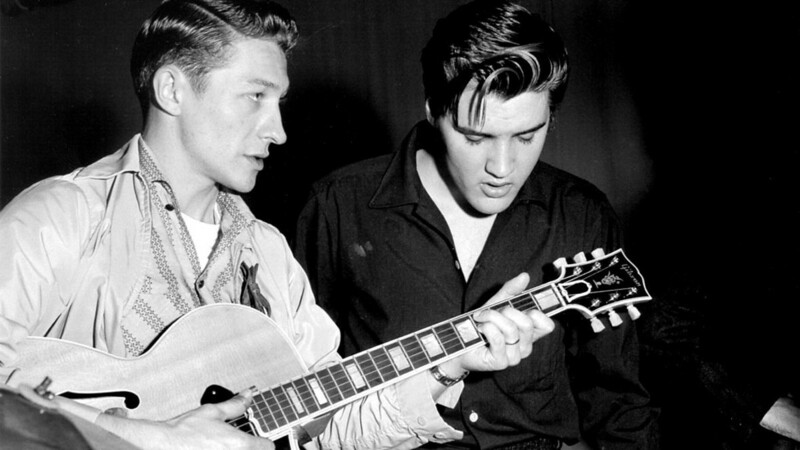 Scotty Moore, left, was the man on guitar for Elvis Presley's earliest recordings. One of the pillars of what we now know as rock 'n' roll died Tuesday in Nashville. Scotty Moore was the guitarist in Elvis Presley's original band, and is the guy behind some of the King's most memorable tunes thanks to his playing on songs like "That's All Right," "Good Rockin' Tonight" and "Mystery Train." If you listen to rock, folk, country, blues or jazz, you've likely listened to someone influenced by Scotty Moore. Keith Richards credits Moore's sound with convincing him to switch from acoustic to electric guitar, and everyone from Jack White to Jimmy Page has sung the praises of the Rock and Roll Hall of Famer. I got the chance to interview Moore back in 2004 for a story I was writing about what many considered the beginning of rock music, when Elvis and his buddies turned up at Sun Records in Memphis and crafted a sound that would start a teenage revolution (all due respect to Chuck Berry and myriad other black artists Elvis stole from). Moore described first meeting Presley for the session — it was July 5, 1954 — along with bassist Bill Black for a session recorded by Sun Records boss Sam Phillips. "We'd run through a whole bunch of songs, for about an hour or an hour and a half, I guess, and we took a little break," Moore told me for the story that ran in The Salt Lake Tribune. "Elvis started just goofing around and started singing 'That's All Right.' Bill and I, neither of us had ever heard it before, so we just started playing along. Sam stuck his head out [of the recording booth] and asked what we were doing, then told us to do it again. We ran through it about four or five times while Sam recorded. "It was just a demo. There was only one mic on him and his guitar, but he played so loud, you didn't need to mic his guitar! And we'd kind of step in and step out away from the one microphone." That cover of a so-called "race record" by Arthur "Big Boy" Crudup marked the point when Phillips and Moore realized that Presley kid was going to be huge. And Moore's guitar is about as important as Elvis's voice.